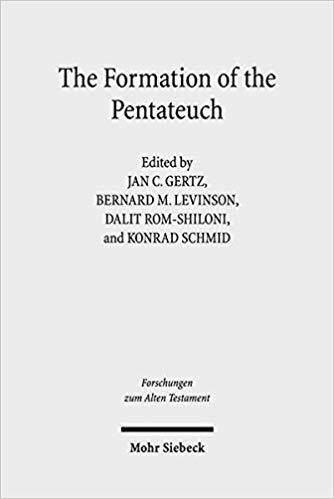 Citation: Reinhard M�ller, review of Jan C. Gertz, Bernard M. Levinson, Dalit Rom-Shiloni, and Konrad Schmid, eds., The Formation of the Pentateuch: Bridging the Academic Cultures of Europe, Israel, and North America, Review of Biblical Literature [http://www.bookreviews.org] (2019). Citation: Mark S. Smith, review of Jan C. Gertz, Bernard M. Levinson, Dalit Rom-Shiloni, and Konrad Schmid, eds., The Formation of the Pentateuch: Bridging the Academic Cultures of Europe, Israel, and North America, Review of Biblical Literature [http://www.bookreviews.org] (2019). Citation: Edward Greenstein, review of Jan C. Gertz, Bernard M. Levinson, Dalit Rom-Shiloni, and Konrad Schmid, eds., The Formation of the Pentateuch: Bridging the Academic Cultures of Europe, Israel, and North America, Review of Biblical Literature [http://www.bookreviews.org] (2019).